One of the worst auto-related problems you can face during winters is a frozen car door. It can be a disaster when you are in rush. Of course, there are practical ways to unfreeze it, but it takes time. And you would definitely not want into getting the trouble of unfreezing it. So, the old saying “Prevention is better than care” is totally apt in such a situation. Let’s look into how you can prevent your car door from freezing and if it has already frozen then you can check out our post n how to unfreeze your frozen car door. Weather effects are the most obvious reasons for a door getting freezing shut. Whenever Icing conditions like snow, freezing rain, freezing fog are predicted, do your best to protect your car from such conditions. Getting your car in a parking area is the most basic prevention measure. So, get your car inside the garage as soon as the weather starts to seem bad. Similarly, don’t leave your car parked outside overnight. Temperatures can drop drastically during the night in winters only to bother you next morning. However, we understand that not all of you have access to a covered parking space or a heated garage or anything similar. In such a situation, a car cover or tarp can be your best friend. A car cover can drastically reduce the amount of moisture from snow and rain that can reach the door parts. Therefore, it is very useful during an ice storm or a similar weather condition. 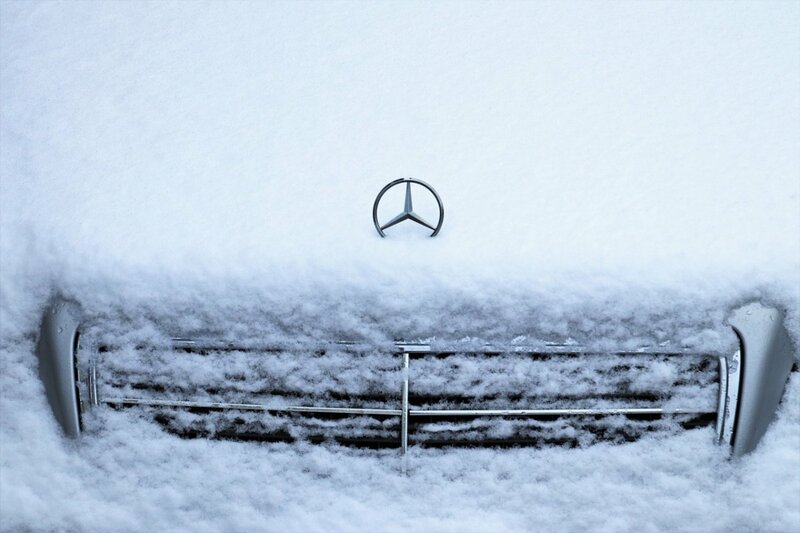 However, it’s still wise to cover your car during winter nights even if the weather seems pretty good. Apart from that, you can also try a small hack. You can use duct tape to cover the door lock to keep it from freezing. This is one of the most basic steps to prevent the door from freezing. Many a times, dust and debris get collected on the door frame which creates a slight gap on it. Due to this, water or moisture seeps in and gets collected around the dirt and in the gap. As a result of which, the door freezes shut when the temperature drops. As already described above, car doors freeze when moisture seeps in through the cracks or gaps in your car’s door frame. Now, many times, the culprit is not the door but the rubber gasket on the door. Check if the gasket is worn, torn or it may be just dirty. Cracks or gaps due to a worn, torn or a dirty gasket can easily help moisture to seep in leading to door froze shut. If the gasket is worn or torn, get it replaced. In some cases, it may not be worn or torn out but it may be too old. It’s better to get that oldie also replaced before it creates a problem. Now, if the gasket is perfectly in shape, it can still lead to frozen doors. The reason is simple and has already been mentioned – You have a dirty rubber gasket on the door frame. So, what’s the solution- just clean it off! You can use a clean cloth and warm water to wipe down all the debris. Then, wipe again with a dry cloth to ensure there’s no moisture leftover behind. Also, make sure that you clean both the gasket on the frame as well as the door. If possible, try to do this “ritual” inside a garage or somewhere warm so that water doesn’t freeze while you clean the gasket. Now, this is one of the best solutions you have. You just need to coat the door rubber gasket with a protective liquid. This liquid could be various things but the best one to use is a rubber conditioner. A rubber conditioner is formulated especially for rubber objects and is intended to last for a long-term. There are other options also though. The next best thing to use is a silicone lubricant spray. It is pretty cheap and can last for several weeks plus it’s also easily available in automotive stores. However, it can damage the paint and therefore should be carefully used. If you don’t have either of the supplies mentioned above, you can also use cooking spray or WD40 or even any light lubricating oil. The purpose to apply the above-mentioned stuff is to use them as a protective liquid so that it repels water and thus minimizes the amount of moisture which enters the door seal. To apply any of the above-mentioned lubricants, you can use a microfiber towel. A paper towel should also work. Spray the lubricant over the rubber gasket and then spread it evenly with the microfiber cloth or the paper towel. You can use rubbing alcohol directly over the lock to prevent locks from freezing. Many times, it’s not the door but the lock which freezes shut. Applying alcohol on the lock at least once a week during winters can help you prevent a frozen lock. However, make sure that the rubbing-alcohol chosen by you has at least 60% alcohol. Rub the alcohol on the lock with a microfiber cloth or a paper towel and spread it evenly. It can also help to melt ice on an already frozen lock but the process is usually slower than other methods of de-icing. You can also use petroleum jelly instead of rubbing alcohol but it tends to leave a messy residue. If rubbing alcohol doesn’t seem to work well, you can use a lock lubricant instead. A lock lubricant is often recommended by experts. However, there are different types of lock lubricants available in the market and often experts tend to differ in their opinion about which one is the best. Graphite lubricants are the most commonly used ones and they generally come in a squeeze bottle of air that can be pressed directly into the keyhole. However, some people find that it absorbs moisture over time and leaves gunk on the key. Teflon-based ones are the most recommended by experts. It is formulated with Teflon Fluoropolymer and provides superior performance. However, the drawback is that many people find it messy and thus not effective. If you can’t bear the Teflon-lubricants, you can opt for grease-less lubricants also. You can also use a WD-40 as a lock lubricant if you can tolerate its smell. Apply the WD-40 liberally on the door and locks before the weather starts to freeze. The straw of the WD-40 can be very effectively used to spray it into the keyholes also. If you face a long winter, you may need to reapply any of the above-mentioned lock lubricants on the lock and door. That’s why we want you to keep a small can of de-icer in your bag or in your garage and that’s how it’s a preventive measure here. So, those were our ten tips to help you prevent your car door from freezing this winter. All of the tips mentioned here are mostly preventive in nature except the last one. However, we have justified why we included that measure here. You’ll need to put these tips into action before the weather starts becoming freezing cold. It would be a good idea to take action with the onset of winter. W hope this post is helpful for you and we would like to know how you benefited from it. Do let us know your thoughts, opinions as well as experiences in the comment section below.